Texas ports play a crucial role in the state’s economy, creating nearly 1.4 million jobs and a total of over $68 billion in federal, state and local tax revenue in the U.S., and about $7 billion of state and local taxes are supported in the state of Texas. Those impacts were highlighted at the Texas Ports Association “Navigating the Future” conference which was held in Austin Feb. 20. Port Houston joined other port leaders, government officials and maritime industry professionals at the event. 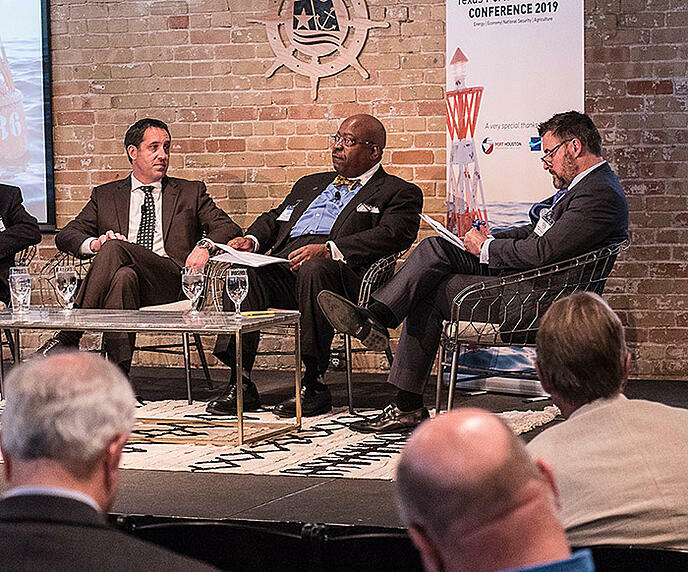 Texas Comptroller Glenn Hegar, Brandon Creighton, Chairman of the Texas Senate Committee on Ports, Texas State Senator Larry Taylor and Congressman Michael Cloud were among the officials participating in the conference. The conference panels highlighted how ports facilitate various aspects of the state and nation economy, such as agriculture, energy and manufacturing. One panel focused on port security as well as their importance to deploying U.S. armed forces. Roger Guenther, Port Houston’s Executive Director who is also the current President of the Texas Ports Association, served as the conference’s Master of Ceremonies.